The most straightforward way to support us is to support our projects with a donation, but if you don’t have the money or would like to contribute in a different way as well, then here are a few ideas for you. If you have an event or a celebration coming up, you can ask people not to bring gifts but instead to donate to an important project. Here a few fundraising ideas that have already worked well for us in the past. Music sales: Le Soldat Pony, the generous musicians behind Chords of Chaos, and others forward their music sales to us. Gaming marathon: You are a famous gamer and will livestream yourself playing a new game once your fundraiser reaches a certain amount. Prizes: Betterplace provides a thank you page that only donors can see. You can put a link there to a prize for your donors. For generic fundraisers, we recommend Betterplace. All our projects are also represented there, linked on the Your Siblings organization page. Just click here to start a new fundraiser, and select one of our projects as beneficiary. Betterplace also forwards all donations in full. Betterplace can’t synchronize the needs with our website automatically, so if you would like to move funds from your fundraiser, but the needs are not yet set up, please nudge us linking your fundraiser page, and we’ll get to it right away. 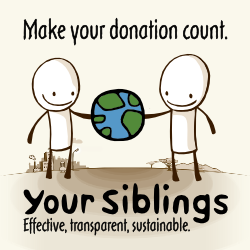 Your Siblings forwards 100% of all donations. Our own costs are covered by sponsors, so if you own a company, please consider becoming sponsor. Another very effective way to help is to spread the word about Your Siblings and our projects. Link our website from your website, tweet about us and #FF us, share links and photos on Facebook, post about us on your blog, create fan art for Your Siblings or our projects, print and spread around our flyers and leaflets, talk to your friends and colleagues, and be creative! If you would like to link to us with something fancier than a text link, please consider the banner and the button below. To embed them, simply copy and paste the HTML code. If you are self-employed—the owner of a store or restaurant for example—you can set up a donation can in your store, with the address of our website on it and ready to receive valuable donations from your customers. Is it time to declutter your home? Then you can sell the things you don’t need on eBay, Amazon, a flea market or privately. You can either donate everything or just a few percent per piece sold. We also hold flea markets from time to time. If you would like to leave the selling to us (and ideally live somewhere in Berlin), please contact us to discuss the logistics.